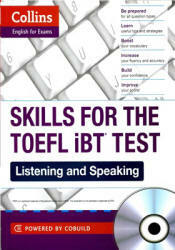 Skills for the TOEFL iBT Test. Listening and Speaking. Collins: 2013, - 223 p.
If you feel overwhelmed by the complexity of TOEFL, Collins Skills for TOEFL iBT Test can help. This book helps you handle the integrated aspect of the tasks in the test, and give you tips and strategies for the different question types you will face. Collins Skills for the TOEFL iBT Test is a two book series (1 Listening/Speaking; 2 Reading/Writing) to help learners prepare for the Test of English as a Foreign Language’, used by over 7,500 institutions in 130 countries as a measure of language ability. To date, 25 million learners have taken the test around the world. In particular these books are aimed at helping learners handle the integrated-skill aspect of the test, where they are required to produce responses based on mixed input. Skills for the TOEFL iBT* Test: Listening and Speaking and its companion edition, Skills for the TOEFL iBT1 Test: Reading and Writing offer a comprehensive guide to the TOEFL test. If you use this series to prepare for the test, you can earn a top score on the TOEFL test and improve your chances at getting accepted by your university of choice. » Skill-specific Challenges and Solutions sections. These sections offer strategy and skill reviews to help you learn how to overcome the most common challenges in each section of the test. » Quick Guide question overviews. Each lesson provides a brief summary of the question type in an easy-to-read chart, making it simple for you to quickly understand what is important to know in order to answer the question correctly. Я Get It Right presentations. These presentations give an overview of the most important steps for doing well on each question. They include useful vocabulary and expressions that you can use when answering the questions and provide tips and tasks for noticing and understanding the important elements of each question type.